- Lots of interesting warps (shooting range, cases, automatic mine, jobs, PvP, parkour, market), built by the best architects! - Big and beautiful spawn. - The server is running on a powerful hardware. The server is capable of supporting a large online without lags! 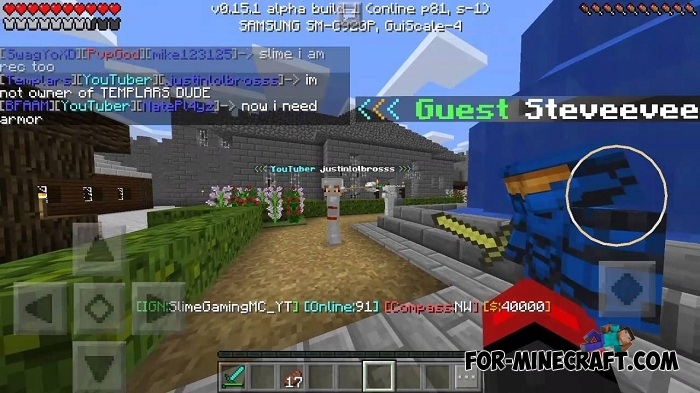 - Bonuses such as lottery, honest pvp, smoking, tops (kills, deaths, broken blocks), the new enchantment system, weddings, particles, game chat, the new crafting recipes, the players heads, and much more! - Server core is stable, lots of bug fixes. - Fully secure registration by mail, the possibility to change the password / delete account. Registration will take you a minute. To register you must enter the password in the chat without a command, write your email and confirm the code.